The older I get, the more tempting it is for me to lean towards fear and doubt of God's goodness. I have known so much pain- in my own life and in the lives of those around me. Some moments and seasons have left me dry, wondering if God really cared and whether He really wanted me. There have been times when there is literally nowhere to go but to Him as my refuge and comforter. It is a rare thing to be so taken by a book and to be able to say, "What? Me too." on just about every page as you read, underline, and cry through the words that seem to have been written just for you. 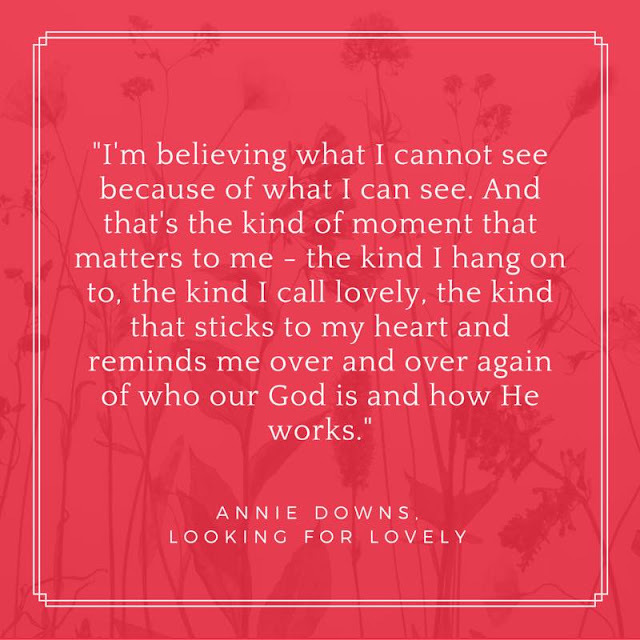 In Looking for Lovely, Annie F. Downs has given us a gift. She has written so vulnerably and honestly, inviting us into dark and otherwise lonely places, helping us to see where God sheds His light. Looking for Lovely: Collecting the Moments That Matter is not a self-help book. It is not a book in which the author offers ten steps to take when going through a hard time so that you can dig yourself out. Instead, this book points you to Jesus. Jesus, who said, "In this world, you will have tribulation. But take heart, I have overcome the world." (John 16:33) Annie so beautifully offers up the hope of Christ as she shares about her journey to find the lovely when there was nothing lovely to be seen in the midst of her everyday. Annie explains that the anthem God has emblazoned on her heart is two-fold: 1) God made you on purpose and 2) God made you to be brave. With that battle cry, she explains how God brought her to a place in which He opened her eyes to His goodness in the valleys in ways that she had never seen before. 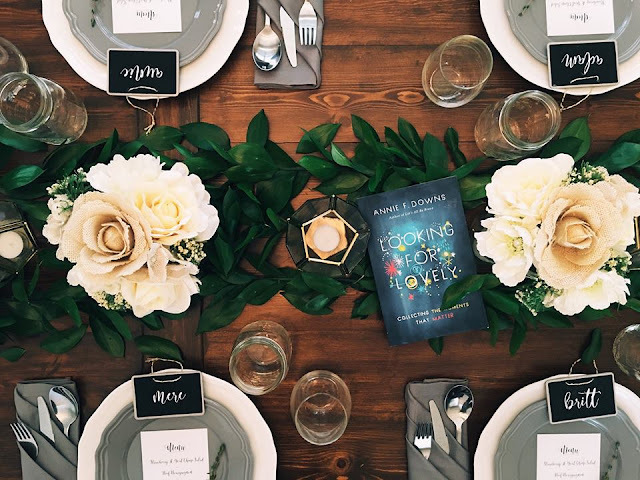 She shares about the ways He spoke to her and helped her to see Him and know Him in ways she wouldn't have on a mountaintop. Friends, I cannot over-recommend this book to you. It is one that you will read, re-read, and that will stick with you. As I have been wrestling and struggling with seeing the lovely in my own life, the Lord has opened my eyes and said, "Look for me. Seek me. I am not hiding." He is so good to use sister friends who are a little further along to mentor us through their writing and help us to see that He is, in fact, good, and that He is in control. There is freedom and peace in knowing that we are not alone in our struggles and fears. What a great review! I felt the same way as I read through this book! It made me sad to know I only had a few pages left because I didn't want our little 'visit' to end! Stopping by from the launch team! May you find Lovely today in unexpected places! Thank you, launch team lovely friend. :) I am definitely going to need to reread it and take it all in. Thanks for reading!